Fill a large pot with cold water, add the saltfish and bring it to a simmer. When the water gets cloudy, dump it out and repeat until the fish is tender. Remove any skin and bones and flake with a fork. Set aside. In a heavy pan over medium heat, fry the coconut oil then add the chopped white onions and green bell pepper. Sautée until they are soft and lightly browned. Add the scotch bonnet pepper, thyme, green onions and the tomatoes. Fry until the tomatoes are nice and soft. Add the flaked cod, and fry for about half an hour, adding water as necessary to prevent drying out. The longer the mixture cooks, the more flavour it has, so I sometimes keep it going for quite awhile. As long as it doesn’t burn, you can’t hurt it. If you are eating right away, add the fish mixture to a serving dish. Drain, rinse and gently steam the ackees, then gently toss them into the fish mixture. Season with fresh pepper and enjoy! If you are preparing ahead of time, transfer the fish mixture to a serving dish, cover and freeze. When you are ready to serve, pop the mixture in the oven and reheat it through. Meanwhile, gently steam your ackees and lightly toss them into the fish mixture just before serving. Season with freshly ground pepper, and enjoy! 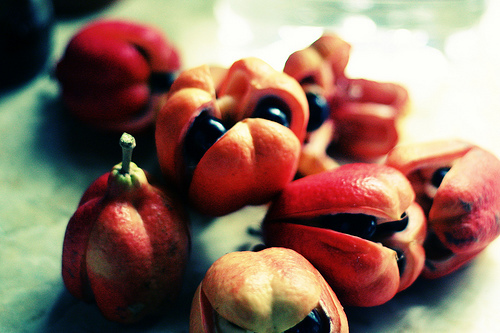 Ackee and saltfish goes well with dumplings, bammy cakes or rice and peas. I like it straight up, though. This entry was posted in Dinner Conversation and tagged Ackee, Ackee and Saltfish, Brunch, Caribbean Food, Cod, Fish, Friends for Life Bike Rally, Fundraiser, Jamaica, Jamaican Food, Recipe, Saltfish, Scotch Bonnet Peppers, Spicy Food, Thyme, Toronto People with AIDS Foundation by mmhague. Bookmark the permalink. It’s been way too long since I have had some good ol’ fashion salt fish! Thanks for posting this. Now I’m hungry…. Made it last week. Yummo!